Nothing Can Stop the Modern Grass Cutter! - Muscle Cars Zone! Are you a gardening enthusiast or you simply want to keep your yard nice and clean? Most of you are, that is why we take a look at the following video and see the Modern Grass Cutter operates. But this is way more than just a grass cutter. RC cars have been our favorite toy since our childhood, but what happens when you join together your childhood and your adulthood? You get a remote controlled lawn mower. Yes, you heard it right. You no more have to go around with you old and boring lawn mower, paying attention if it got stuck and how much fuel is left. The Modern Grass Cutter will do all the work for you; all you have to do is sit back and watch it. Though the video is very short, just 30 seconds or so, it is still enough for the modern beast to show off his abilities. You though that the steep terrain could possibly be a problem? Wrong, it has a set of four large wheel combined together with its weight and center of gravity, it is stable enough to go everywhere. All you have to do is to start it up, pull the handle up and you are good to go. You can also adjust the speed. Few test runs were filmed and people seem to have been utterly impressed by its abilities. 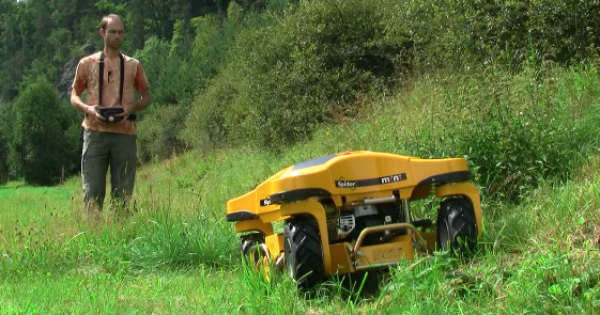 What do you think, is the future of lawn mowing here and it will do all the work for you? Finally, check out the best new lawnmowers!